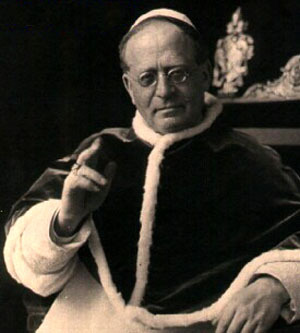 The following letter was sent by Pope Pius XI to the Most Rev. John Mary Harty, Archbishop of Cashel and Emly, on 18th January, 1939. It was the last letter that pope sent to Ireland, before his death a few weeks later. Venerable Brother, health and Apostolic Benediction. When We learned that the solemn day of the 25th anniversary of your Episcopal consecration was at hand we immediately had Our paternal congratulations on the happy event conveyed to you by telegram, but We feel that you have deserved so well of the Church and have so faithfully served with filial devotion this Apostolic See that some clearer and more lively expression is called for, so We decided to send you this letter also to affirm Our special friendship for you and to convey more explicitly Our good wishes. Meanwhile We earnestly pray the Giver of all good gifts that He may preserve and guard you for many long and fruitful years filled with heavenly gifts. Let Our Apostolic Blessing be the promise and pledge of these gifts from above and a witness of Our special love for you. We give it most lovingly to you Venerable Brother, and to the clergy and faithful entrusted to your care.